Summer is right around the corner. This means pool days, sundresses, maybe an exciting tropical vacation, and, unfortunately, frizz. For those of us with wavy or curly hair, the heat and humidity of summer can make styling a nightmare. And taking a flatiron to your hair everyday is not only time consuming, but damages the follicles even further, causing brittle, breakable hair and split ends. No, thank you. Luckily, scientists and stylists have been working hard to develop several hair smoothing treatments that not only make hair straighter, shinier, and easier to manage, but actually improve the overall health and quality of the hair. The two most popular ones you’ll see in salons are Keratin Treatments and the Brazilian Blowout. These treatments both bond protein to the outer layer of your hair, which strengthens, softens, and relaxes it. And the results last for months. So, what’s the difference? If you’re looking to try a smoothing treatment to manage your hair this summer, it’s important to know which one is best for you and your hair. While every head of hair is different, I almost always recommend the Brazilian Blowout to my clients because it works faster, it requires less maintenance, and it’s better for more hair types. But don’t just take my word for it. Let’s go over the details: 1. It works faster Brazilian Blowouts only take 1-2 hours in the salon, and then it’s totally finished when you walk out. Your stylist will wash your hair once, apply the product, and then blow dry and flat iron your hair. After your hair is completely dry, they’ll wash your hair a second time to rinse out the product. Finally, your hair is conditioned, rinsed again, and then dried for the final time. After just a couple hours, you walk out the door with gorgeous, frizz-free hair. Keratin Treatments usually take up to three hours in a salon. 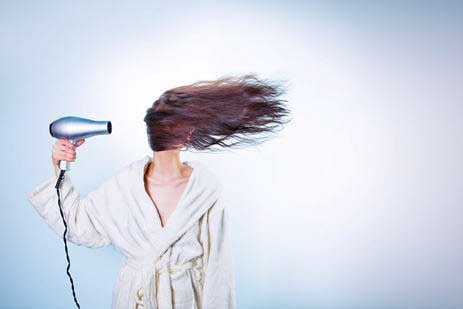 First, your stylist will use a clarifying shampoo to wash your hair, towel dry it, and then blow it completely dry. Then, the keratin product is applied evenly throughout your hair, section by section. Your stylist will then place a cap over your hair to let the product soak all the way through your hair. Finally, your hair is blow dried and flat ironed at a 450 F setting. After up to three hours in a salon, you then have to wait three more days to allow the keratin to crystalize. Keratin treatments are really only best for people who have thick, unruly, and over-voluminous hair. If you have very thick, unmanageable curls and want to reduce the volume in your hair, keratin may be the way to go for you. In my salon, I also offer a Keune Keratin straightening treatment, which has the same straightening effect, but has its own unique process and the benefits of the Brazilian blowout. Here’s a before-and-after of this treatment on one of my wonderful clients: And regardless of what kind of hair you have, the positive effects of a Brazilian Blowout are actually cumulative. That means the more you get the treatments, the healthier your hair will become over time. Cumulative keratin treatments actually tend to dry your hair out over time L Keratin treatments are really only best for people who have thick, unruly, and over-voluminous hair. If you have very thick, unmanageable curls and want to reduce the volume in your hair, keratin may be the way to go for you. In my salon, I also offer a Keune Keratin straightening treatment, which has the same straightening effect, but has its own unique process and the benefits of the Brazilian blowout. Here’s a before-and-after of this treatment on one of my wonderful clients: But if you have normally textured or fine hair, a keratin treatment could knock the life out of it. Most clients want to keep the natural volume and movement of their hair, while making it sleeker and more manageable, making the Brazilian Blowout the better all-around treatment.